Hullbridge took all the three points from a game that they largely dominated at Cricklefield but Ilford’s young team certainly didn’t roll over. Hullbridge got down to business straight away; within the opening minute Brandon Bullman was off his line to punch away a ball aimed towards Yemi Adelami. It was a timely intervention from the young Foxes ‘keeper, but he was picking the ball out of the net in the 3rd minute after Emmanual Okunja fired a shot that handed the leaders an early lead. The early goal may have settled Hullbridge’s nerves, and they certainly didn’t rest on their laurels, as they kept trying to get balls to their frontmen. But slowly Ilford got a grip on the game and started chipping away themselves. Good approach play by Callum Maltese ended up with him laying off Ibrahim Llukaley whose shot was blocked by Dan Okah. The Foxes had two further efforts just placed wide, firstly a Billy Golledge header then Collins Atubrah stroked a shot narrowly the wrong side of the post. 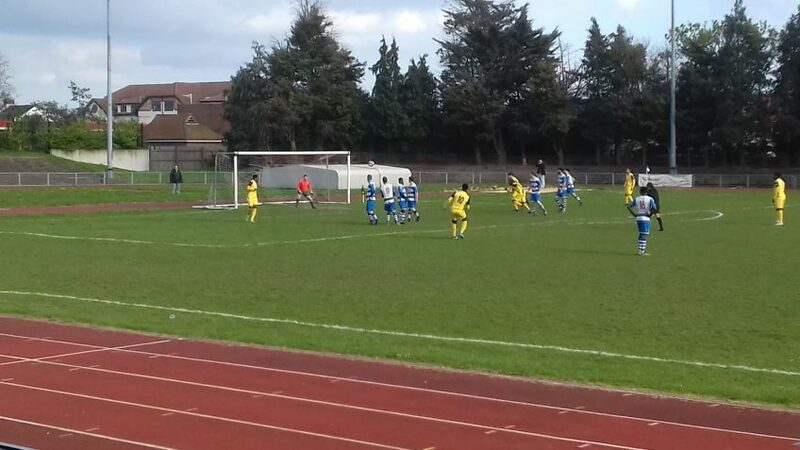 Matthew Baxter drilled a shot over Ilford’s bar in the 20th minute. Three minutes later and Hullbridge thought they had extended their lead when some neat one-touch passing ended up with Okunja putting the ball past Bullman, but celebrations were quickly curtailed as the goal was ruled out for an offside. The hosts quickly retaliated, won two free kicks in quick succession, both taken by Callum Maltese, the first being headed away for a corner by George Whitby, while the second curled round the Hullbridge wall and needed George Marsh to pull off a diving save to keep out. The rest of the half belonged to Hullbridge though. A nice passing move in the 37th minute ended with Nathan Scarborough placing a header into the side-netting. The hosts then were reduced to ten men after a late, feet up challenge by Steven Sylvester-Ajudua on Scarborough saw him receive his second yellow card of the game. That meant the red card followed and so Ilford had now handed the league leaders a numerical advantage. Hullbridge had strong appeals for a penalty turned down after Baxter was bundled down in the box. And before the half was out Hullbridge went close to scoring their second when a Matt Rose free kick rattled the Ilford cross bar. Hullbridge opened the second period still on the front foot, looking to get that second goal and Adebola Sotoyinbo flashed an early effort across Ilford’s goalmouth before the goal they were looking for finally came in the 51st minute. The ball worked its way across Ilford’s box, finally coming to Scarborough who took a touch before rifling his shot beyond Bullman to put Hullbridge fully in control. Hullbridge went on to have the lion’s share of the possession, passed the ball quickly at times but Bullman only had to get down to cut out a Joe Wright grass cutter, as well as saving a brace of free kicks from Sotoyinbo. Hullbridge didn’t over-extend themselves, they didn’t really have to as the second goal deflated the hosts who presented little upfront to suggest that the points at the 80th minute mark weren’t going to end up at Low Road. Ilford: Brandon Bullman, Luke Casey, Alejandro Seone-Butler, Steven Sylvester-Ajudua, Danny Haigh (Capt), Billy Golledge, Collins Atubrah (Ryan O’Connell 69’), Lamarr Douglas, Ibrahim Llukulay (Andre Embalo Junior 76’), Callum Maltese, Connor Kain. Hullbridge Sports: George Marsh, George Whitby, Matt Rose (Capt), Jamal Allen, Dan Okah, Greg Frederick, Matthew Baxter (Joe Wright 62’), Adebola Sotoyinbo (Josiah Ereku 88’), Nathan Scarborough, Yemi Adelani (Luke Hornsley 86’), Emmanuel Okunja. Scorers – Emmanuel Okunja (3’), Nathan Scarborough (51’), Luke Hornsley (90+4’).